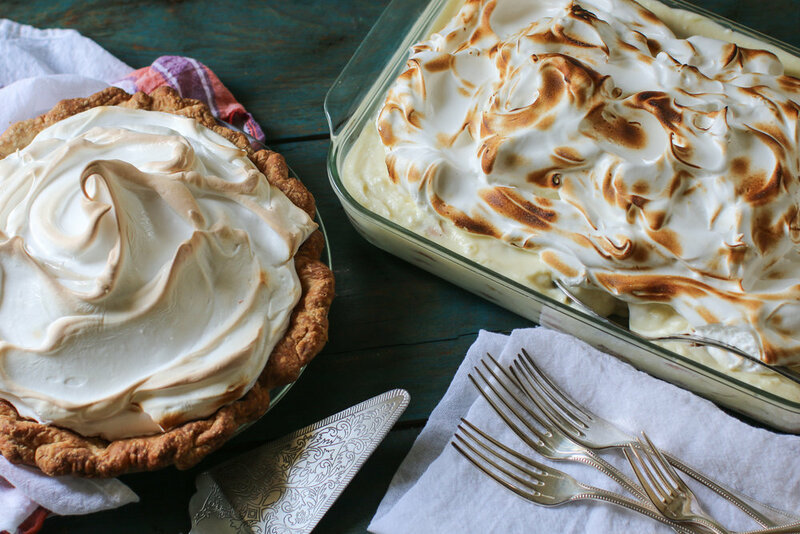 Delicate in texture and heavenly in flavor, meringue is the perfect topping for your warm weather desserts such as banana pudding. Meringue is simple in terms of ingredients, but timing is everything. When done right, your egg whites are whipped into stiff peaks at the same time that your syrup bubbles to the perfect temperature. The two mixtures are carefully whipped together to create the fluffiest meringue. Swirl this luscious topping on my favorite dessert recipes creating lemon meringue pie or banana pudding with toasted meringue. Master this recipe and you’ll be topping all of your desserts with this sugary confection. This is the perfect dessert for a crowd. Why is this banana pudding recipe the perfect dessert for a crowd? Because it’s a large batch dessert, and there’s layers of custard, bananas, vanilla wafers with that luscious meringue on top. There are so many ways to enjoy meringue, and I’d like to see your version. Share your creation by tagging me on Instagram at @y_delicacies. This recipe was published in the April/May 2019 issue of Inside New Orleans magazine. 1. In a medium bowl, whisk eggs until well blended and set aside. 2. In a large heavy bottom pot, whisk sugar, cornstarch and salt to combine. Very slowly pour half-and-half and vanilla into pot, whisking constantly, until lump free. 3. Cook over medium heat , whisking frequently, until milk is heated, beginning to thicken, about 10 minutes. Immediately remove pan from heat. 4. While whisking eggs, slowly pour 1 cup of heated milk into eggs, until well combined. Slowly pour egg mixture into pot while whisking vigorously to combine. 5. Cook over medium heat, frequently whisking, until pudding is gently bubbling and thickened, about 5 minutes. Pour into a large bowl and cover pudding by pressing plastic wrap directly onto the surface. Refrigerate until chilled, about 4 hours and up to overnight. 1. Using an electric mixer with a whisk attachment on medium speed, beat the egg whites and cream of tartar until soft peaks form, 5-7 minutes. With the mixer running on low speed, slowly add ¼ cup of sugar. 2. Increase the speed to medium-high and beat until stiff peaks form, 8-10 minutes. Try to coordinate the timing of the egg whites reaching stiff peaks at the same time the following boiled syrup reaches 248°. 3. Meanwhile, in a small sauce pan fitted with a candy thermometer, whisk together remaining 1 1/4 cup sugar and water. Bring to a boil until thermometer reads 248°F, the firm ball stage. Pour syrup into a heatproof cup with a pour spout. 4. With the mixer running on slow speed, slowly pour the vanilla then the syrup in a steady stream in the space between the beater and the bowl, avoiding pouring onto the beater. Increase speed to medium-high and until the meringue thickens into a marshmallow like texture, 1-2 minutes. Immediately scoop onto prepared dessert. 1. Spread one-third of the pudding on the bottom of dish. 2. Top pudding with half of the vanilla wafers and half of the banana slices. Repeat layers one more time. Finish by topping with the remaining third of pudding. 3. Prepare meringue and spoon over pudding and swirl decoratively. Use a kitchen torch to toast meringue, or place under broiler to toast in spots. Keep chilled until ready to serve. Do Ahead:Pudding can be made and chilled up to 1 day ahead. Banana pudding with toasted meringue can be assembled up to 1 day ahead. Keep chilled until ready to serve. Lemon Meringue Pie for another delicious recipe using Marvelous Meringue.